I have started developing a Roland style dual VCO, complete with quantized pitch range, dedicated LFO and Noise Source. Inspired by the Jupiter 8. The A[/b]M8120 module is a versatile dual VCO with some unique features, that will be familiar to customers with analog polyphonic synthesizers! The traditional sawtooth VCO cores use NPN matched transistor expo generators and are followed by waveform shapers to produce Triangle, Pulse and Sine waveforms. Precision voltage regulators ensure a stable frequency, and Range switches enable the VCO's to be switched up and down in octave intervals. I have added a semitone quantizer to VCO2 Range, a dedicated LFO with a wide range of waveforms, including S&H and Delay. With Noise and low frequency mode on VCO2 and of course VCO sync. 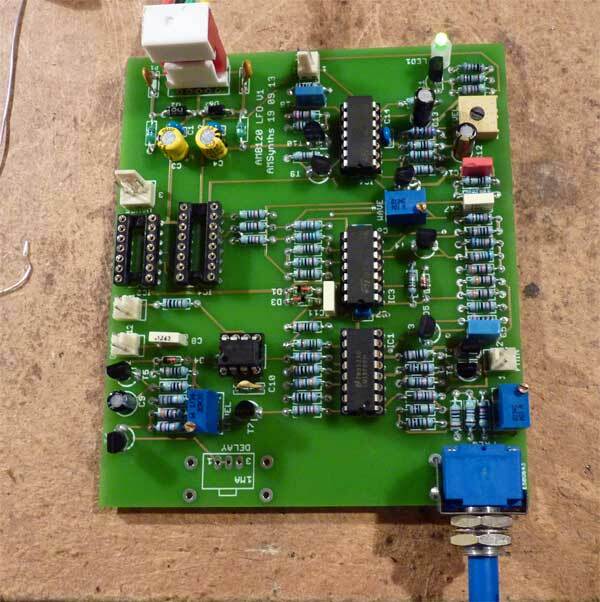 The LFO is the first stage of the development, and the prototype is now completed. Nice Rob. Sounds very Rolandish to me. I am sure it will be wicked. Keep em coming mate. Oh boy! Another one I will have to purchase after the Athena synth. Favourite mono is the Odyssey and favourite poly is a tie JP-8/OBX. New AMSynths modules are designed to be 35mm deep and are skiff friendly, including the AM8120. A single VCO will be launched in May, the AM8125. the "reserve a module" function on your site is either broken or you never respond. i've "reserved" modules twice in the past year and never heard back. Same here. I got what I have by checking the store nearly every day for what seems like the past year.